An image from a Twitter user of an alleged device on the train at Parsons Green tube [Image: @RRigs]. The question has to be asked: Would a terrorist have been able to plant an improvised explosive device (IED) on the London Underground if Theresa May had not cut the police’s ability to detect and prevent such attacks? 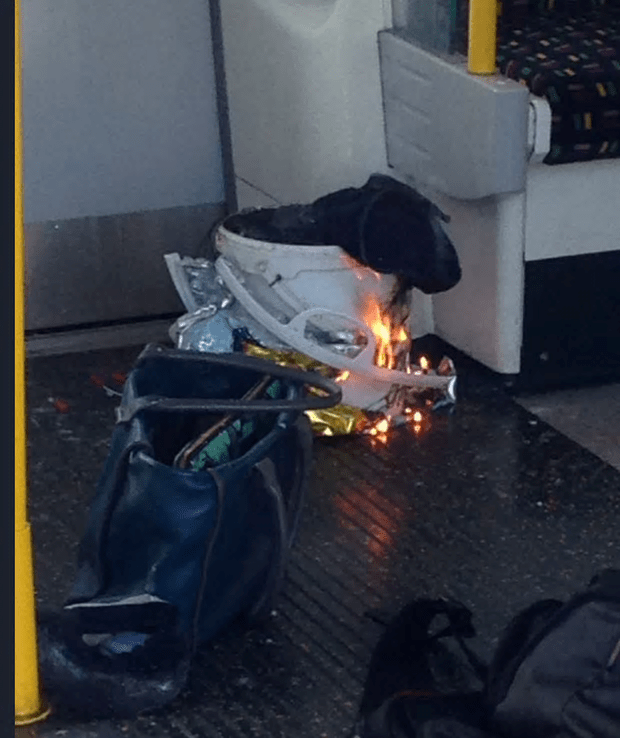 It seems highly unlikely that 22 people would now be receiving treatment for flash burns after the device partially exploded at Parsons Green station, if the ability of the police to gather intelligence about planned attacks had not been seriously hindered by the Prime Minister of the United Kingdom. This Writer published an article detailing how Mrs May dismantled our counter-terrorism ability earlier this year, and I have re-posted it in the wake of the latest attack. You can read it here. It seems clear that nothing has been done to address these failings. And don’t forget that more police cuts are on their way. This is proof that Theresa May is a threat to our national security. But she is still sitting in Downing Street, pretending to be a prime minister. WHY? An explosion that injured a number of people at Parsons Green underground station in west London was a terrorist incident, the Met police have said. Police later confirmed the blast came from an improvised explosive device. NHS England said 22 people were receiving treatment at three hospitals as well as an urgent care centre in Parsons Green. None was thought to be in a serious or life-threatening condition. The incident is the fourth terrorist attack in the UK this year, following incidents at Westminster, London Bridge, Manchester and Finsbury Park in north London. The UK terrorism threat level remains at severe, meaning an attack is highly likely. Although flash burns are very painful at least no one died, for which we should be thankful, whilst accepting that police numbers and security staff should never have been cut I don’t think that has a bearing on this case. The attempt seems to be amateurish by the standards of the known terrorist groups, and although Isis or another group might claim responsibility, whether, or not, it was them, this seems to be something else. But Mike she cut the police numbers last year so how can it,inTory stupidity, have an effect this year? Because the cut in numbers last year will have a lasting effect this year and in the future. What a load of political rubbish….. If you’re going to comment with a bald statement, at least try to back it up with information, otherwise the other people here will rip you to shreds.